Transcription of Obituary in the Primitive Methodist Magazine by T.R. On Wednesday, June 12th, 1901, there passed away at Hull, in the person of Mary A. Semper, a soul of truly heroic type and mould. Her’s was a nature which combined in an unusual degree simplicity and insight, sweetness and light, the truly gentle and the truly strong, and with all a transparent soul, clear as crystal. She was born on January 1st, 1835, and receiving her first ticket of membership at the age of seventeen she continued in unbroken fellowship for forty-eight years. For twenty-seven years Mrs. Semper was associated with our Williamson Street Society, where she adorned her sacred profession in season and out of season, exerting everywhere a precious spiritual influence in both church and neighbourhood. As local preacher, class leader, and Sunday School teacher, she rejoiced in spiritual work for her Saviour, and prayed, testified and conversed unceasingly on her one loved theme. Two years later she came on the preachers’ plan, and almost from the commencement did the work of an evangelist in the villages of North Lincolnshire. “In labours more abundant ” is the most fitting summary of these years. Though inheriting a frail constitution and often ailing, she had a passion for soul-saving work, and did not know how to spare herself. Possessed of a quiet and unostentatious spirit, she shrank from all display as foreign to her nature, and the records of these early missions were kept as the profoundest secret until her translation to the higher service. They possess a peculiar interest. At Bucknal and Bardney, Belshford, Tealby, New Bolingbroke, and Thimbleby, the Spirit was richly poured out, and many were the souls that professed to find liberty. 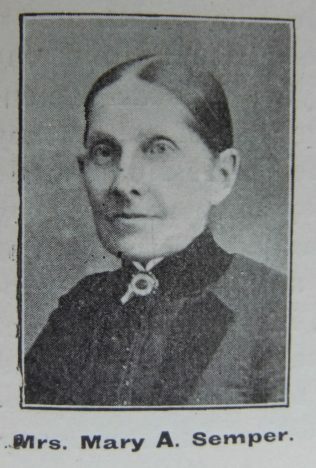 In the year 1874 she came to Williamson Street with her husband and son, who are still serving the church, the former as a local preacher, and the latter as a minister, and here she took a local preacher’s share of the appointments with more than ordinary acceptance. It was during one of the visits of the sainted George Warner that the Mothers’ Meeting was commenced, and for many years Mrs. Semper was acting president, ministering consolation to hundreds of toiling mothers. For twenty-five years a teacher of the Young Women’s Class, and for twelve years a society leader of the young people, by the beauty of her life, and the winsomeness of her words, she exercised an almost irresistible fascination upon the young people, and her memory is a precious heritage. The interment at the Hedon Road Cemetery was preceded by an impressive service in the Williamson Street Chapel, and a largely attended memorial service was held in the same place on Sunday, June 23rd. Mary was baptised on 25 January 1835 at Miningsby, Lincolnshire. Her parents were Joseph, an agricultural labourer, and Rebecca. Mary married Richard Semper (abt1835-1917), an agricultural labourer and later a grocer, in the spring of 1866 in the Lincoln Registration District. Census returns identify one child.